Preventive dental care is essential throughout your life, no matter what your age might be. By practicing good oral hygiene at home and scheduling regular checkups with our office, you can keep your smile bright and healthy for many years to come. Brush your teeth at least twice a day with a soft-bristled toothbrush. Use fluoride toothpaste to remove food particles and plaque from the tooth surfaces. Be sure to brush the top surface of your tongue; this will remove any extra plaque-causing food particles, and help keep your breath fresh! Clean between your teeth by flossing at least once a day. You can also use a mouthwash to kill bacteria and freshen your breath. 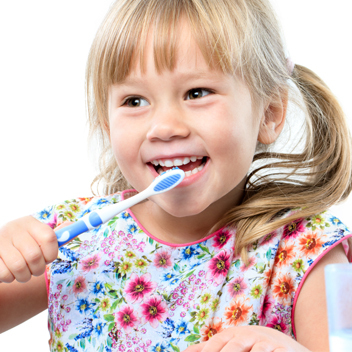 Decay-causing bacteria can linger between teeth where toothbrush bristles can’t reach. Floss and mouthwash will remove plaque and food particles from between the teeth and under the gum line. Remember to schedule regular checkups with Dr. Egidio every six months for a professional teeth cleaning. Ask our team about dental sealants: protective plastic coatings that can be applied to the chewing surfaces of the back teeth where decay often starts. If you play sports, be sure to ask us about special mouthguards that are designed to protect your smile. Slide the floss up and down, and repeat for each tooth.